St Patrick’s Day, the day of green and well… I think beer? When I lived in Boston, this was a holiday that was celebrated in a big way by the entire city. You most certainly have St. Patty party plans if you live in Boston! One day of enjoying fabulous food and drink is nothing to get upset over. In fact, it is important to remember that 1 day is just 1 day of your entire year. When holidays become a concern is when the over indulgences spread into the days prior to and after the holiday! I still have clients that tell me their co-workers are giving out holiday chocolate from DECEMBER! If it has Santa on it, JUST SAY NO. When it comes to St. Patty’s day don’t forget to give back to your liver. If you know you will be enjoying a weekend full of festivities go ahead and get your liver supporting and nourishing supplementation now! So, when it is all said and done, you can provide your body with antioxidants and liver support from the cellular level outwards. Just remember that with indulgent beverages, over the top eats, and stress, your liver might need a little love. Check out our Clean Slate, containing nourishing liver ingredients and powerhouse antioxidants to support your liver health. There are 2 servings in this container each with 35 calories and 7 g of carbs….. delish and not too heavy on the carb or sugar. It is a beauty! 2. Whatever burger or sandwich you are enjoying on St. Patty’s day, try wrapping it in GREENS instead of white bread. Try kale, collards, or lettuce… Which part do you really enjoy anyway? If it is the yummy burger with avocado, cheese, and sautéed onion, why waste the calories and carb on the bread? If you love the bread more than the burger… Go and check out our product called CARB CRUSH! Every Carb Lovers best friend, thank me later! 3. Eat some chips! 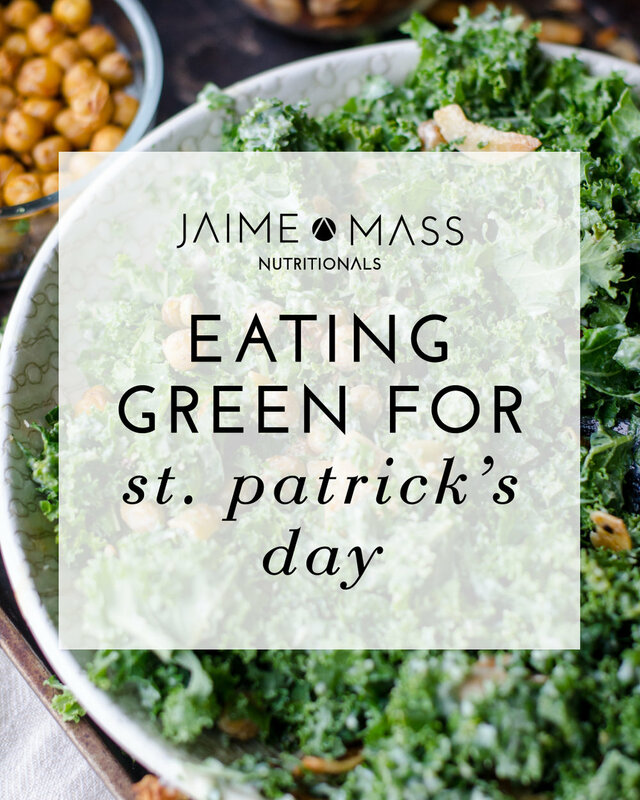 KALE chips that is… And bring them to the party too! They will be a hit! Buy a lot of Kale because it shrinks big time, and be careful how much olive oil you use because as it shrinks it can actually get more oily then you need! Remove leaves of kale from the stems, (make sure they have been washed and dried well). Drizzle with oil and mix it together so it is even throughout. Mix in black pepper, dash of salt, and cumin if desired. Place the leaves on a baking sheet, if you need more than 1 sheet that is fine (go ahead and spread it out). Place in the oven to bake at 350 F for 10-15 minutes, depending on how crispy you want them! Watch the chips and you can take them out when they are as brown as you desire. ENJOY! Happy Day of Greens!